We first told you about the unique Phillis Wheatley School in New Orleans, and the efforts of the World Monuments Fund to save it, back in October 2009. The good news- the building is still there. The bad news is the structure isn't getting any better, and a permit for demolition was recently requested. A petition asking the Mayor of New Orleans, Mitchell Landrieu, to stop the plan to demolish the school building has been circulated. The letter cites the school's importance to the black community as well as its unique architecture. Currently the petition has nearly 1100 signatures. 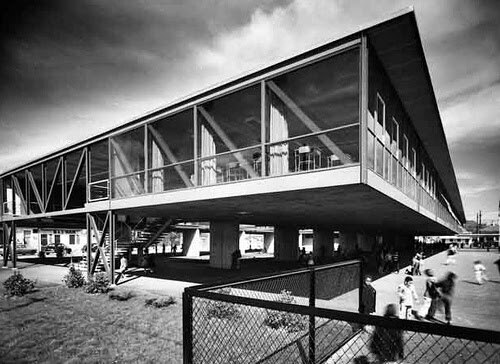 Built in 1954, the school's cantilever design is unique to say the least. It takes advantage of its own footprint to provide much needed shade from the noon-day sun. A plan for a possible re-use of the site has even been proposed by DOCOMO-Louisiana.